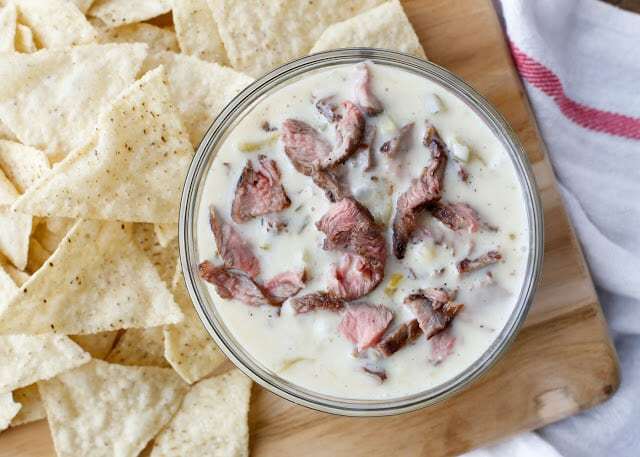 Steak Queso Dip is creamy, spicy, smooth, cheesy and fully loaded with tender bites of steak. This queso is better than anything they’re serving at your favorite Mexican restaurant. We devoured this cheesy dip with tortilla chips the first time we made it and I couldn’t resist making it again a few nights later and pouring it over nachos. There is just enough heat in this Steak Queso Dip to keep you coming back for one more bite. If you like it extra hot, I recommend doubling up on the jalapeños. We still absolutely love the original Restaurant-Style Queso I’ve shared here before, however this is a very hearty queso that can easily be a meal along with some chips on the side. 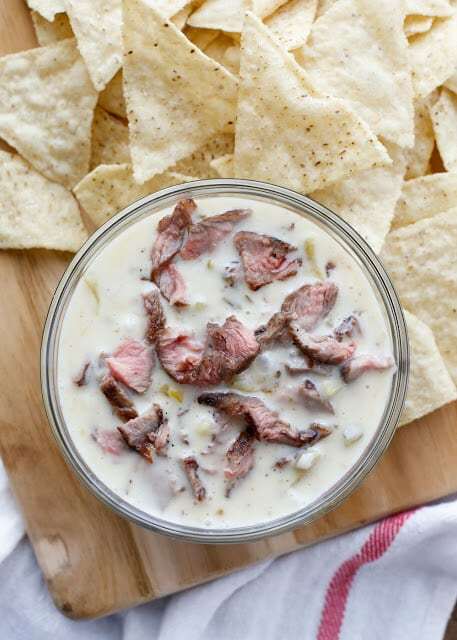 Next time you’re grilling, set aside an extra steak so that you can make this Steak Queso Dip. You will not regret it. Kitchen Tip: I use this knife, this bowl, and this spatula to make this recipe. 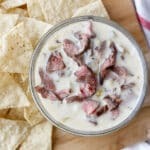 Creamy, spicy, smooth, cheesy and fully loaded with tender bites of steak, this Steak Queso Dip is better than anything they’re serving at your favorite Mexican restaurant. Combine the cheese, green chiles, jalapeños, jalapeño juice, milk, water, and cumin in a medium size glass bowl. Microwave for five minutes, pausing to stir after every minute. The dip will be very watery at first, but it will thicken as it finishes cooking. While the dip is cooking, slice the steak as thinly as possible and then cut into bite-size pieces. Add the steak to the queso when it finishes cooking. Stir to combine and let rest 3-5 minutes before serving. Serve hot with chips for dipping. Enjoy! The recipe is made with simple white American cheese (not to be confused with another cheese product that is shelf stable). You should be able to find plain white American cheese in the deli at any grocery store. I recommend grilling the steak to medium rare or medium. The more tender the steak, the better it will work in the queso.